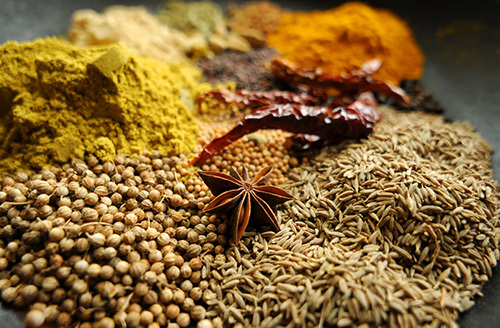 Indian cooking is characterized by the use of a variety of spices and herbs, and our indian restaurant in Cornwall subscribes to the use of spices in our most-popular indian cuisine in St Ives. People often refer to Indian food as ‘spicy’. This does not mean Indian food is hot (though sometimes it can be). It means Indian food is flavourful and delicious. 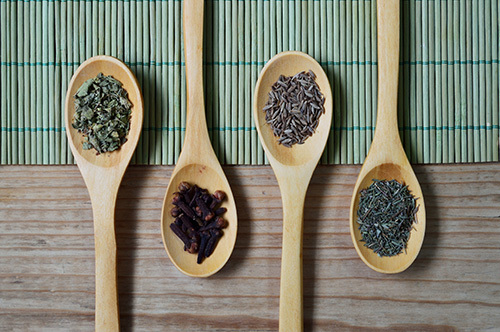 For centuries, Indian chefs have been using spices to make the food flavourful. 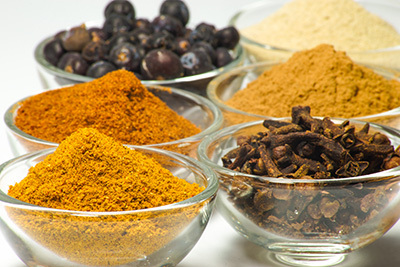 But often times along with taste and flavor, these spices make Indian food good for health too. 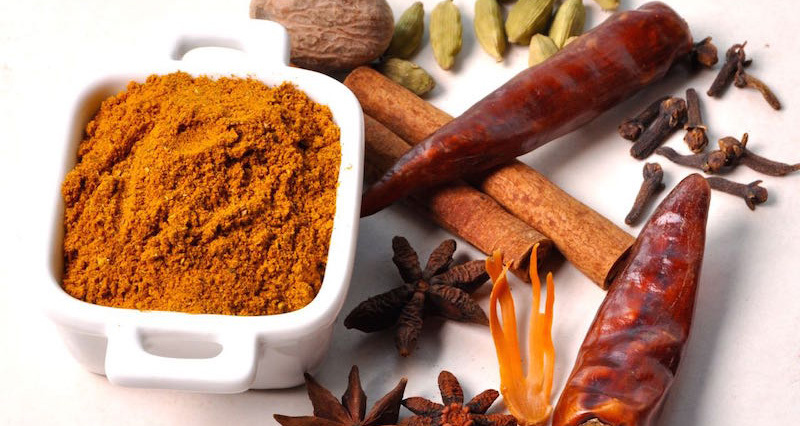 Almost all Indian spices have some health benefits or medicinal properties. Some health benefits are pretty pronounced and can be observed relatively quickly. At other times the benefits are subtle and may take some time to be noticed. Medical literature and scientific studies lists a variety of health benefits and medicinal properties of Indian herbs and spices. The benefits range from aphrodisiac properties to anti-cancer properties, from anti-inflammatory properties to blood sugar and cholesterol reducing properties, from relief of morning sickness and sore throat to treating heart ailments - the list goes on. It is neither the scope of this webpage nor are we qualified to discuss these in great details. Speak to the knowledgeable and friendly staff at our indian restaurant in St Ives when ordering your meal with us. 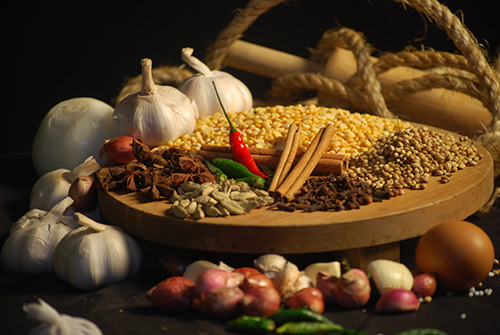 We will happily highlight the spices used in our dishes. Listed below are some well recognized health benefits of some of the more commonly used spices in Indian cooking. Onions, and other members of the same botanical family like garlic, chives, leeks, scallions, and shallots, are highly useful herbs possessing great culinary and medicinal values. Some of their beneficial effects are seen only after long-term usage. Onion may be a useful herb for the prevention of cardiovascular diseases, especially since it diminishes the risk of blood clots. Onions also protect against stomach and other cancers, as well as protect against certain infections. Onions can improve lung function, especially in asthmatics. The more pungent varieties of onion appear to possess the greatest concentration of health-promoting phytochemicals. Aids digestion and memory. 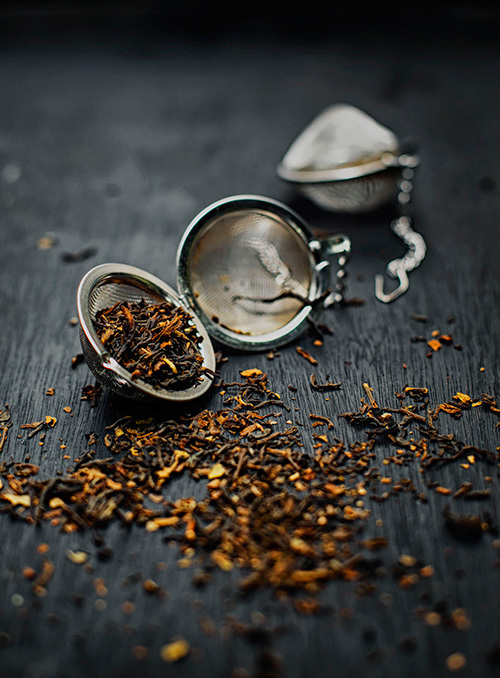 Tea made with it, when cooled, can be used as wash for oily skin. Bay leaves are often used as a natural headache remedy. They are also used as herbal cold remedies. This versatile spice is included in a wide range of dishes, from Indian curries to desserts and teas. It’s believed to counteract stomach acidity, stimulate appetite, ease nausea, cure bad breath, and relieve gas and bloating. Cardamom has also been used as both an aphrodisiac and to fight obesity. But more study needs to be done on how well it may aid weight loss. And aphrodisiac? Well we like to believe that every exotic thing is an aphrodisiac. This super hot spice is a powerhouse of healing many things - too numerous to list here. Some of its benefits include speeding of metabolism, relief of aches and pains of arthritis and other pains due to sprains, strains, and bruises (Capsaicin Cream is made from cayenne pepper), warms body and stimulates blood flow, prevents blood clots, heals ulcers, effectively relieves symptoms of cold and flu, dramatically reduces blood sugar, lowers cholesterol, treats high blood pressure, improves heart health, kills certain cancer cells, immediately stops heart attack ... the list goes on. Garlic is considered as natural remedy for a number of ailments. The important uses include treatment of acne, for cardiovascular health and for lowering cholesterol and high blood pressure, as an anti-bacterial agent, as an anti-arthritic agent (to treat joint pains), to improve digestion and so forth. It also helps the body to produce certain antioxidants which have benefial effects on the liver. In India people still rub warmed cooking oil with crushed garlic in it on the chest and back (particularly of babies, but adults also) to relieve chest congestion due to cold. Like many of the other herbs and spices used in Indian cooking, the ground seeds of fenugreek have anti-inflammatory properties and help in digestion. Fenugreek seeds are also believed to reduce blood sugar levels and have been used as natural supplement for use with insulin. Fenugreek seeds are also a potent expectorant, and is used for natural remedies to ease congestion, allergies, and bronchitis. Paste of fenugreek seeds applied to the scalp and later rinsed off with a dandruff shampoo is an effective treatment for dandruff. Ginger is used to treat many things including nausea from morning sickness and nausea related to motion sickness (travel sickness). Its anti-inflammatory properties help ease muscle and joint pain. It also has a diaphoretic property (promotes sweating) and so is used to cleanse and detoxify the body, stimulate circulation, and ease bronchitis and congestion. Adding crushed ginger to tea while steeping it, is a common practice in India and is often used as household remedy for throat pain and cough due to common cold. Ginger is also considered as an aphrodisiac. This spice is a rich source of antioxidants, has anti-inflammatory properties, eases digestion, and reduces both sugar and cholesterol levels in the blood. It also helps stimulate blood flow and is a herbal remedy for poor circulation. Cinnamon also has the reputation of being an aphrodisiac. The active compounds in clove lend it anti-bacterial and anti-fungal properties. It also has some anti-inflammatory effect. Clove oil is widely used to treat toothache. These seeds of the cilantro plant has antibacterial properties. It also helps soothe the stomach and relieve bloating. It also has anti-inflammatory properties and coriander oil is a natural remedy for arthritis pain. Not only loaded with powerful antioxidants fennel also contains fiber, folate, potassium, and vitamin C. It is believed to boost the immune system, reduce blood pressure, and aid in detoxification of the body. It contains compounds that help relieve smooth muscle spasms, which in effect, helps ease abdominal cramping and spasms. Fennel seeds are a natural remedy for bloating and gas. Chew a teaspoonful of fennel seeds after each meal to prevent gas. Fennel seeds also prevent bad breath. That is why Indians chew fennel seeds after meals. This bright yellow spice, one of the most important spices for cooking "curries", has many medicinal properties. (Turmeric is one of the main ingredients of "curry powder".) Its primary antioxidant, curcumin, is an essential ingredient for liver detox, and is also a natural arthritis treatment for its anti-inflammatory effects. The latest scientific studies are showing that turmeric may also be a promising diet aid that fights belly fat by inhibiting the growth of fat cells. Turmeric is even used to treat certain forms of cancer (along with conventional treatment). A paste made out of turmeric and quick lime ("Chuna" in Hindi) and applied to the affected part is very commonly used in India as an effective home remedy for sprains.